It wasn’t until 1980 that the American Psychiatric Association added Post-Traumatic Stress Disorder (PTSD) to its manual, making this disorder a comparatively new one that many in the public still misunderstand. There are numerous resources that can provide you a better glimpse of the clinical nature of PTSD, but sometimes the words of those who (unfortunately) know PTSD most intimately can give you a more accurate idea of what it’s like to deal with the insidious issue. This is perhaps the most succinct description of PTSD that you’ll ever read. Though symptoms vary according to person, one of the most common complaints is reliving the traumatic event over and over through flashbacks and nightmares. Art With Impact highlighted the documentary Buried Above Ground, which features a variety of people who suffer from the disorder – from a woman displaced by Hurricane Katrina to a survivor of domestic abuse – who detail how their lives have been derailed by terror, alcoholism and isolation. Another common manifestation of PTSD is avoiding certain events and feelings, for fear that they will trigger an episode. In Art With Impact’s exclusive interview with Amy Oestreicher, a Broadway performer who endured severe medical trauma, she discusses how she completely turned off her artistic side for a time. 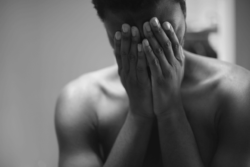 Like depression and anxiety, a common narrative among PTSD sufferers is a complete numbing of feelings that can damage relationships, jobs and chances of recovery. That quote is from Army Psychologist Brig. General Loree Sutton from the documentary Thank You For Your Service (not to be confused with the Miles Teller film), which Art With Impact wrote about back in February. The heartbreaking, infuriating documentary extensively covers how we have failed our veterans, through the voices of experts and people who have been battling PTSD for years. Unfortunately, there is still an immense amount of stigma around discussing PTSD, but the message of the film is clear: It’s up to all of us to dismantle the silence that continues to devastate our armed forces. This quote is about the protagonist from the film Mensch, spotlighted by Art With Impact staff, dares to take viewers inside the brain of a person with PTSD, as a way to simulate the incredible distress that occurs in private. For twelve minutes, the film submerges viewers in the mental abyss. Many filmmakers have taken on PTSD, using the art form to translate the misunderstood disorder for viewers who cannot understand what it might feel like to live in fear of your own brain. Though the more dramatic of us might casually throw around phrases like “I’d rather die,” this sentiment is not an exaggeration for some who endure PTSD. The veteran who spoke these words is from the film Of Men and War, which previewed at the Human Rights Watch Film Festival and was first discussed by Art With Impact in 2015, only one year after the number of veterans have who died from suicide surpassed those who died in Iraq and Afghanistan.